Rivals shows are loud and intense. Come rock with us! Sometimes show info is a bit more up to date on our facebook page. Want Rivals to play your town or punk rock house party? let us know. Have you heard about Rivals' Annual Rock 'n' Roll Halloween? 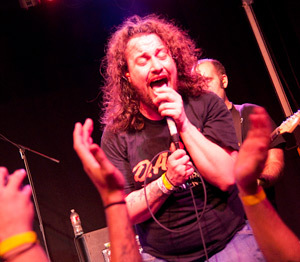 Since 2002, Rivals has thrown the South Bay's biggest Halloween party and rock show featuring the best in local bands. Ten years strong, the show gets crazier every year. All bands rock in costume and prizes are awarded for best costumes; male, female and couple. Rivals has played as Dead Rock Stars (2002), The Wizard of Oz (2003), Ghostbusters (2004), 80's WWF Wrestlers (2005), Super Mario Bros. (2006), Star Trek (2007), Willy Wonka and The Chocolate Factory (2008), A Clockwork Orange (2009), The original Karate Kid (2010), and Star Wars (2011). What will they be next year? Stay tuned and see for yourself!